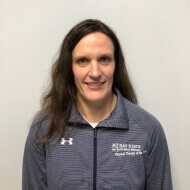 Susan graduated from Grand Valley State University in Michigan where she received her Masters of Science in Physical Therapy in 2000. She has worked since graduation in outpatient orthopedics treating all ages. Throughout her career she has taken continuing education courses to keep her skills up to date. Susan is currently focusing on aquatic physical therapy and is the primary aquatic physical therapist at the Kingston office.